I love photography, but if you know me, then you know that I am always busy with other crafts and fine art projects as well! I love to keep my hands busy creating, actually it’s a bit of a compulsion from when I was a tiny child, and I just can’t stop. If I am not making one thing, I am making another, I keep my Etsy Shop stocked with all of my other, ever changing, crafts! Painting rocks is a serious passion of mine! When it was first suggested to me by my mother I just couldn’t get my head around the concept. I LOVE rocks, we have rocks all over our house from various adventures and outings, and I had no idea why anyone would want to paint on them. They are already so beautiful! When we were moving from Eugene OR to the east coast, at our moving tag sale, I had rocks out holding up things like books or holding down papers and someone asked if they could buy a rock, and I was like, “Ummm, no way! I will sell my books and my juicer, but the rocks, those I will be shipping to the east coast!” I love my rocks so much! But once I started painting rocks I was hooked! I love looking at them and deciding if they want to be a heart, or a chicken, or a Matryoshka doll, or a peace sign… The possibilities are endless, you can see some of my rocks in the painted rock section of my Etsy Shop, they are ever changing! Fiber arts are a staple in my art and craft life. Right now I am super into Indigo Dying, but in the past I have been an avid weaver and also have done quite a lot of needle felting and embroidery. My mother is a quilter, and her grandmother was a pretty masterful seamstress, so fiber arts are in my blood. I love creating one of a kind pieces with cotton and wool and thread! On my Etsy Page you can see my Indigo work as well as some of my embroidered felted wool ornaments! I am working to upload things like my Indigo ombre dyed Macrame! 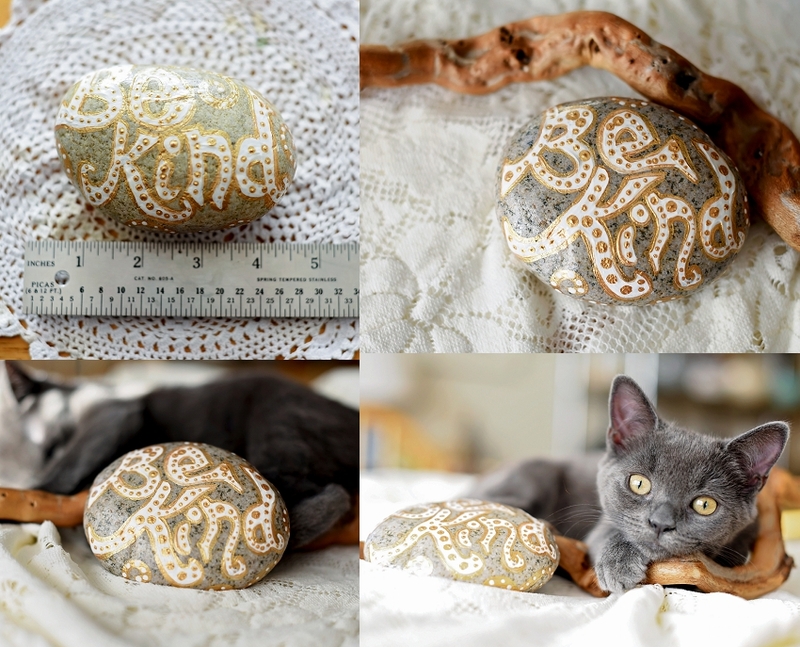 At the end of this post you can see just how helpful “Totoro the kitten” was yesterday while I was photographing my hand painted rocks to post in my Etsy Shop! I have been into textile dying for some time, but recently really wanted to learn the Indigo and Shibori techniques. So I set out to learn all I could last winter so I could be all set to try it out this past spring and summer. It is a fascinating process involving natural dye extracted from the leaves of certain plants. The dye reacts to the sunlight and oxidizes into the amazing blue tones only really possible with this one type of natural dye. The cloth comes out of the vat a green color, and turns blue through time and light. Each time you dip a piece of cloth into the vat and allow it to oxidize, the color intensifies. 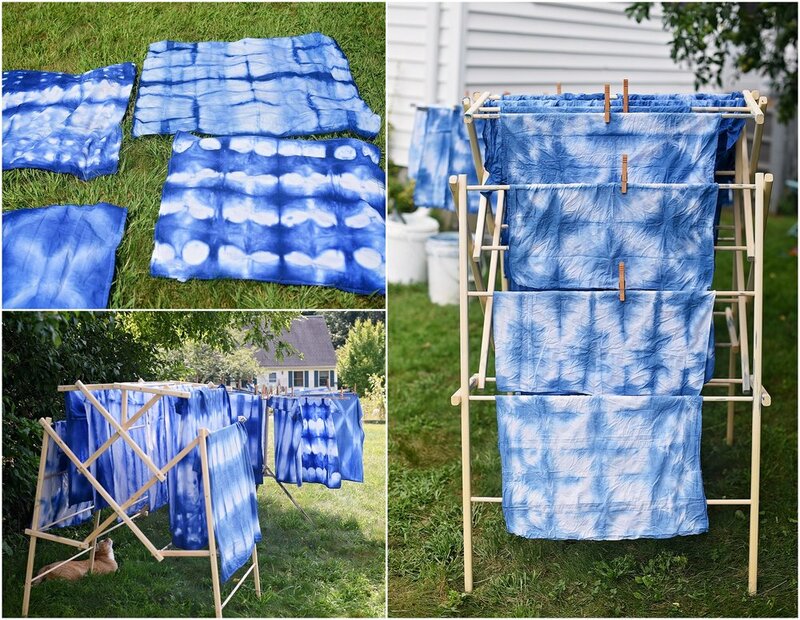 I use traditional Indigo Dye and the folding and resist Shibori Technique traditionally used to create the beautiful blue and white patterns seen here on my drying racks. I have my 100% cotton Flour Sack Tea Towels up on my Etsy shop. I need to get the Macrame up there, and I am happy/sad to say that I sold out of my napkin sets in record time this year, I will have to make more next spring! We are on a quest to have 0 waste in our home. We already buy in bulk and seriously limit processed food and therefore the packaging associated with processed food. And we have no paper towels at all, so these towels come in super handy! They brighten up kitchens and bathrooms while bringing joy and happiness with their bright blue and white patterns! When I look at them I feel like I am looking at a perfect summer sky while laying on the beach. I also use them as “wrapping paper”, not only does that reduce waste even further, it gives the lucky recipient two presents in one! I also have four pillow covers left in my shop. I have these in my own living room, and everyone loves them so much! They fit a standard 20x20 pillow insert. These ornaments are a serious labor of love! I make them out of 100% wool felt hand dyed by a local artist using only plants and other natural materials to get the beautiful colors! I then hand embroider the images using thread, and make the pompoms and tassels myself using wool yarn. The amazing reindeer with ornaments and strung lights was drawn by my daughter, I then trace it and slowly hand stitch it onto the wool felt. Each one is totally unique an has Joy or Merry stitched onto the back. See them here! Of course I also have prints and sets of cards in my shop! Don’t think I would skip out on the photography! All of my fine art photography is created using vintage cameras and real film! 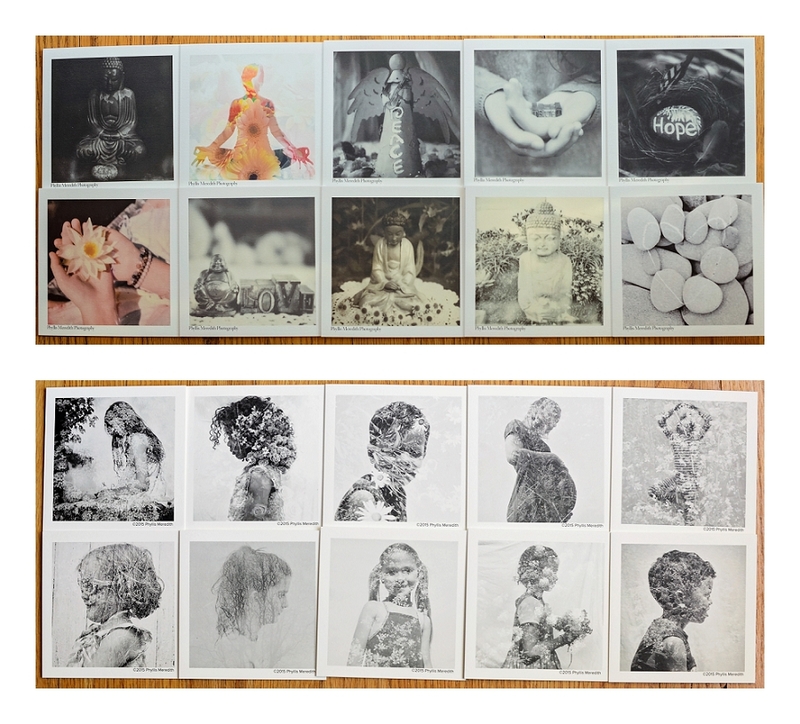 I have sets of cards created with instant film, and sets of just my HumaNature images and a set of cards of (some of my) Vintage Camera Collection. Now how did I take the photos of the camera while using one of my cameras? Ahhh a secret! You can see them in the photography section of my Etsy Page! My Etsy page is ever changing. In the past I have had hand painted signs, wool felt headbands, jewelry, weaving, embroidered photography…. I am steady with photography, but crafting is ever evolving with me! I keep creating, and I hope you will find something that calls to you, I am just one little artist trying to carve out a living and support my family and I thank you all for looking at my work! I have to give a special shout out to this little ball of trouble for all of the help she gave me while trying to photograph my hand painted rocks yesterday. Thank you so much Tiny Totoro!